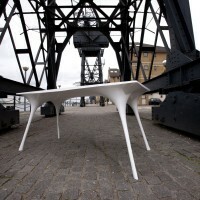 London-based designer Il Hoon Roh has created the Pneu (Pneumatic) Table. 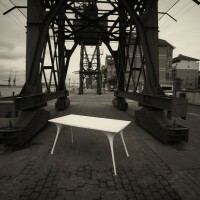 This handmade architectural sculpture Pneu (Pneumatic) Table is a project that has taken the designer nearly three years. 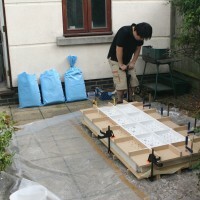 He began this project in 2008 and completed it for the Aram Gallery London exhibition in September 2011. The designer’s main purpose for this project was to develop a method to combine two different families of self form-finding structures. The designer began researching pneumatic structures as such structures are among the self form-finding structures found in the natural world which have been the basis of the designer’s other projects. In addition, the designer sought to find a way to naturally incorporate and combine the knowledge gained from his previous investigations in order to form an integrated hybrid structure. Architect and engineer Frei Otto has stated that different families of self form-finding structures can be grouped together to form hybrid structures. 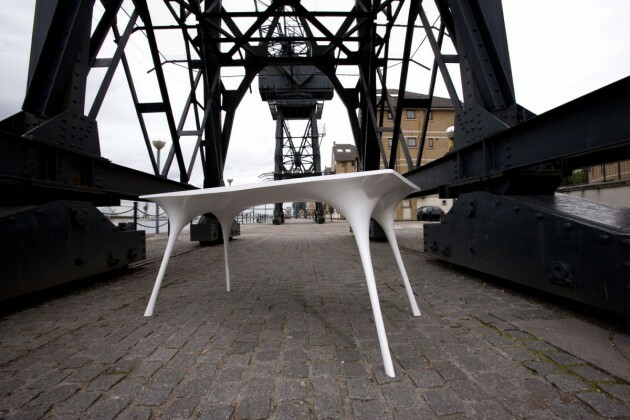 The Pneu (Pneumatic) Table was an experiment to see how Otto’s hypothesis may apply to the designer’s approach of designing architectural sculptures modelled on self form-finding structures found in the natural world. 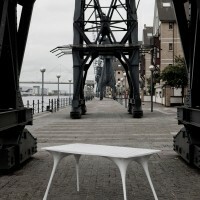 The Pneu Table project was developed in two key stages. 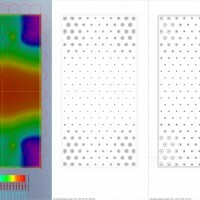 The first stage was utilising structural analysis software to see and analyse the structural pattern of pneumatic structures found in the natural world. 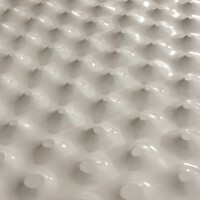 The designer then used the information generated to carry out an experiment through inflating balloons, which led to the creation of the top surface. 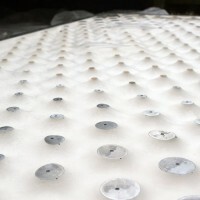 The second stage was to combine the fabric stretching technique from the designer’s previous projects (Radiolaria series) with the top surface. 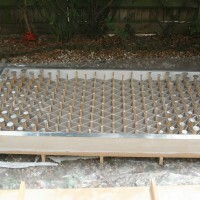 Combining these two investigations generated a unique pattern and sculpture which successfully illustrates how two separate self form-finding processes are utilised within a single table structure and how such a hybrid structure benefits the design of and also structurally reinforces the sculpture. 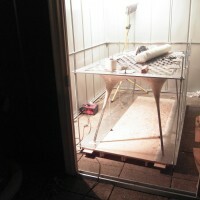 Watch a video of the table being made on YouTube – here. Visit Il Hoon Roh’s website – here.